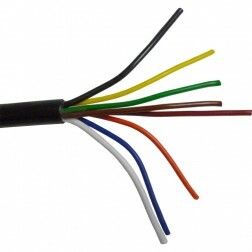 Two 8-wire rotor cables are available, a heavy duty one with #16 & #18 wires and an extra heavy duty with #14 & #18 wires. Our "PE" (polyethylene) outer jacket is unlike most others which are PVC. PE is direct burial and can be laid through water such as streams, ponds, etc. ; plus, it's life is approx. 25% longer than PVC.